In this line of work you are supposed to be objective when viewing a movie, so that you can write a balanced critique. However, after having my heart melted by a dancing baby Groot within minutes of this movie’s opening, that is a tricky task. Baby Groot is quite possibly the most adorable creature ever committed to screen. If you have no clue who or what a baby Groot is, then chances are you are not this movie’s core audience. However, given that the first instalment was such a monster hit, it is a fair assumption that most of you know what I’m talking about. I won’t remind you of the plot of the first movie, but this picks up after the events of that with the group of misfits – Peter Quill (Pratt), Gamora (Saldana), Drax (Bautista), Rocket (Cooper), and baby Groot (Diesel) – now officially a team. 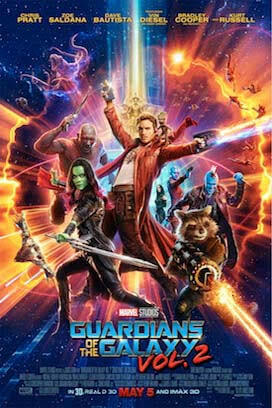 After Rocket double-crosses a client, they are forced to crash-land on a nearby planet, where they encounter Ego (Russell) who claims to be Peter’s long-lost father. Although Peter is suspicious, he agrees to accompany him to his planet, and learns the truth about his origins. But the client they double-crossed still wants revenge, and hires Yondu (Rooker) the Ravenger, who raised Peter, to track them down. But Yondu knows that Ego’s intentions towards Peter aren’t honourable, and with time running out, he, Rocket and baby Groot must try and convince Peter of the truth about his father, before the whole universe as they know it is destroyed. While that may sound like a pretty straightforward sci-fi plot, there is nothing straightforward about the execution. Gunn has, well, all guns blazing in his attempts to entertain, and it works. This is beautifully constructed, with a fantastic mix of humour, heart and high-octane action. Less than five minutes into the film, we are treated to one of the most hilarious fight scenes you will probably ever witness, and laughs prevail throughout. Gunn has done a fantastic job on the script, and even the character development doesn’t feel contrived or forced. All the actors do an amazing job, and have a fabulous chemistry, and there are some astonishing cameos from David Hasselhoff and, erm, Howard the Duck! The music is also a huge part of this film, and the ‘Awesome Mix’ that they’ve compiled for it is, well, awesome. These are songs that everyone knows, but may not have heard in years, and they really add to the energy of the film. Of course, as you would expect from such a big budget Disney/Marvel production, the effects are fantastic. But unlike many sci-fi offerings, this isn’t just a visual spectacle, and you really do care about what is going on. Underneath all the aliens and explosions is a story about the meaning of family, and the need for connection with others. Basically, this is far more clever and cerebral than it appears on the surface. Believe the hype – this is fantastic. It completely backs up its razzle-dazzle with some great characters and writing. The world it inhabits may be populated by aliens, but at its heart, this is a real human story. Also, which is unusual for a sequel, it is as good as the original. (Actually better in parts although it is not as ‘fresh’). Exciting, entertaining and engaging, this is exactly how blockbusters should be. Far more intelligent than many similar offerings, you will have all the feels by the end of this. If you haven’t seen the first one yet, I would recommend watching it, to bring yourself up to speed, although it is not a pre-requisite for enjoying this. And do sit through the credits, as there are no less than five additional sequences tagged on for your viewing pleasure. ← 14th International Dublin Gay Theatre Festival – Opens this May Bank Holiday Weekend!